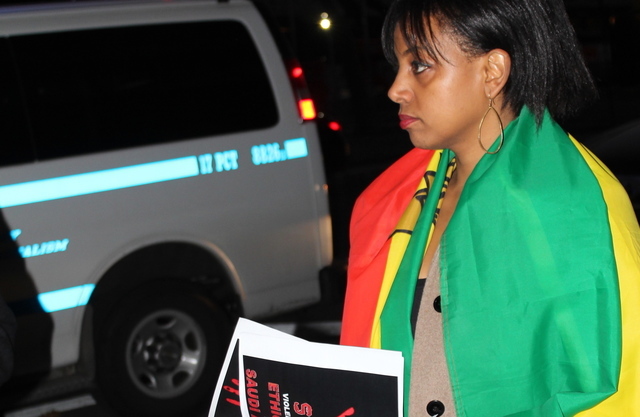 New York (TADIAS) — Ethiopians in New York made their presence felt outside the Permanent Mission of Saudi Arabia to the United Nations on Monday, November 18th. The demonstration followed last week’s deadly immigration crackdown in Saudi Arabia that claimed the lives of several Ethiopian citizens. The diverse crowd included members of the Caribbean and other African communities joining fellow Ethiopians around the world who are holding similar events this month to raise global awareness and to protest the recent killings and continuing mistreatment of migrant workers in Saudi Arabia. There are still tens of thousands of undocumented Ethiopians in limbo facing danger without adequate legal protection in the region. More protests are scheduled this week in front of Saudi embassies and missions including in Los Angeles. Stay tuned for updates. Photos: Vigil for Alem Dechassa Outside Lebanon Embassy in D.C.